This section includes items that are not part of the Infantry Equipment, Pattern 1914, but are associated with it. The Sling, rifle, pattern 1914, was perhaps, destined to be forever misunderstood. Entered into the List of Changes under L. of C. No. 16978, dated 6th September 1914 (the entry directly after that entering I.E. Patt. '14), it seems that it is always assumed to be either (a) part of the Infantry Equipment, Pattern 1914, L. of C. No. 16977, or (b), somehow associated with the Rifle, magazine, .303-inch, pattern 1914, L. of C. 17798. In actual fact it is neither. Its L. of C. entry reads in part "[t]he sling is introduced for use with the Pattern 1914 infantry leather equipment (L. of C. 16977) but it is also suitable for general use, except with mounted units in possession of the cavalry rifle bucket." 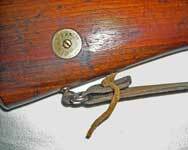 The Sling, rifle, pattern 1914, is shown here fitted to a Carbine, Magazine, Lee-Enfield, fitted to to take 1888 pattern sword bayonet, or as it is more commonly known, a New Zealand Pattern Carbine. The Sling is maker marked "H.G.R." for Hepburn, Gale, & Ross, and is dated 1915. It is in the Service Dress colour, but like W.E. Patt. '14, later Slings were made in the darker London Brown. This Sling is a leather strap, 43 1/2-inches long by 1 1/4-inches wide. It has a fixed loop on one end, as well as a free running loop. 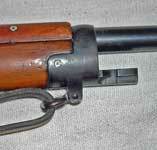 To fit this sling to a rifle, the free end is passed though the front sling swivel from the rear, then looped around it and passed through, first, the running loop and then the fixed one. The free end is then doubled back through the rifle's rear sling swivel and tied with a leather thong. The Sling is an shorter, narrower version of the Sling, rifle, brown, infantry, introduced under L. of C. 4855, 29th August 1885, as part of the Valise Equipment, Pattern 1882. The Sling, rifle, pattern 1914, was used long after Infantry Equipment, Pattern 1914 was declared obsolete, and was still being manufactured in Australia as late as WWII. This leather Frog for the early war three jawed Wire Cutters is interesting on several levels. It is not part of any equipment pattern, and could just as easily have been used with B.E. Patt. '03 as with Pattern 1914. We've chosen to put it here because it seems that, rightly or wrongly, whenever this type of Frog turns up, collectors always associate it with I.E. Patt. '14. Another interesting point is its resembles to the webbing Wire Cutter Frog later introduced for the folding Wire Cutters. Details of that type of Frog can be found on the W.E. Patt. '08 Associated Equipment page. This example is maker marked "Beckworths Ltd." and dated 1914. From the Chris Cutting Collection, photos © Chris Cutting 2009.